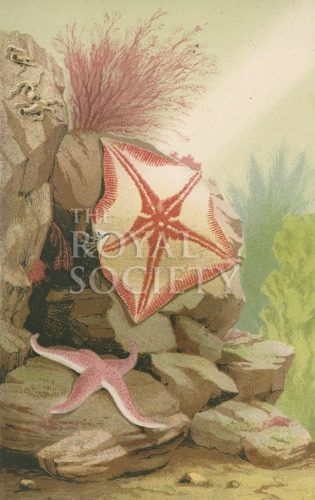 Underwater scene showing starfish, including the Goose foot starfish (Anseropoda placenta, described by the author as Palmipes membranaceus) on rocks. Plate 3 from the book The aquarium: an unveiling of the wonders of the deep sea, by Phillip Henry Gosse (Van Voorst, London, 1854). Inscribed: ‘Pl.III. P.H.Gosse, delt. Hanhart, Chromo lith. STAR FISHES’.